New Directions in Urban-Rural Migration: The Population Turnaround in Rural America covers a wide-ranging treatment of urban-rural migration and population growth in contemporary America. 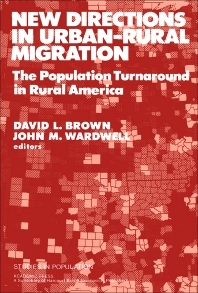 The book discusses the national and regional changes in internal migration and population distribution; the regional diversity and complexity of economic structure in modern-day rural America; and the reasons for the gap, or lag, between changed conditions and unchanged policy. The text also describes the turnaround's implications for new models of migration; the economic framework for the turnaround; and the traditional concept of the migrant as labor and the structural conditions within and between areas that fix the demand for labor. Migration trends and consequences in rapidly growing areas, as well as data resources for population distribution research are also considered. Sociologists and people involved in studying migration will find the book invaluable. Why Should Public Policy Focus on the Rural Turnaround? Why Has Public Policy Not Focused on the Turnaround?